An ale yeast is called top fermenting because of its tendency to flocculate (gather) at the surface of the brew during the first few days before settling to the bottom.To brew an ale, fermentation must take place in warmer temperatures for the yeast to multiply and do its magic. 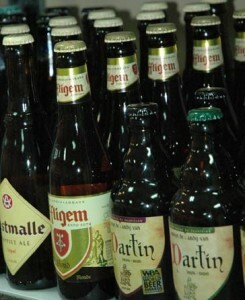 Ales are usually higher in alcohol and will be noticeably fuller and more complex. The lager yeast simply flocculates (not at the surface) and sinks to the bottom. Therefore it is known as bottom fermenting. Lager yeasts need cool temperatures during fermentation to perform their magic. Lagers tend to be lighter in color and usually taste drier than ales. They are generally less alcoholic and complex. This is the most common beer type sold in the U.S.